TreadSafe® GRP ladder rung covers are designed specifically to fit over traditional steel ladder rungs on fire escapes, service ladders and the majority of access ladders. They withstand the harshest of environments and resist chemical attack from corrosive fluids transferred from the sole of the boot. 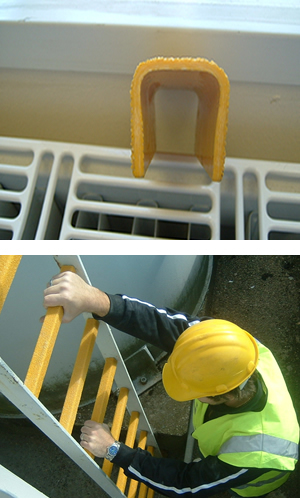 Easy to install, they are bonded to the existing ladder rung using a high quality polyurethane structural adhesive. Standard sizes are 25 x 25mm in lengths of 1200mm, 600mm and 400mm, all in high visibility yellow.